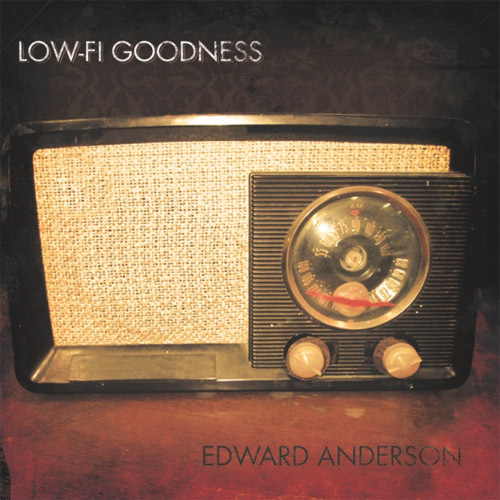 Edward Anderson escapes the shadows of projects like Magic Box and most of all Backyard Tire Fire to release his first solo album, Low-Fi Goodness. This 8 song EP plays like the solo project that it is. It is stripped down and often just features Anderson’s banjo accompanied by only his foot stomping. Low-Fi Goodness starts with the epic line “It’s hard to think about tomorrow when you’re trying to make it through today.” on the album’s first single “Tears At Bay” making for the albums most memorable tracks. The next song, “Robbed In North Carolina,” has the gentle touch of an acoustic guitar while “Tears at Bay” is driven by a banjo. “Robbed In North Carolina” is a strange twist on a love song that takes you down the dark side of memory lane. The album continues to alternate between banjo and guitar tracks all the way to the end. The banjo songs have a rough touch while the soft strums of the acoustic guitar give the remainder of the songs a completely different feel. The clear highlight of the EP is “Bums In The Sun” with its twisted first person narrative about how a person can fall through the cracks and become ruthless. With its soaring chorus of no remorse it makes for one of the most interesting narratives you’ll hear. “Patiently” profiles a man facing maturity and being blindly honest when put on the spot. The mixture of songs keeps the listener interested and the repeated themes make for an oddly unique experience that will keep you listening. This entry was posted in 250 word album reviews and tagged 250 word album review, 4 Stars, Ed Anderson, Edward Anderson, EP Backyard Tire Fire, Low Fi Goodness, Magic Box. Bookmark the permalink.